With 2013's halfway mark already slowly fading away in the review mirror one could easily argue that this year hip-hop has been lacking when it comes to organic, gritty street-approved hip-hop records. For those feeling the noticeable void the rhymes of Milwaukee rapper Yo Dot on his latest track "The Struggle" may come as a welcomed listen for those sore ear indifferent to current mainstream and/or indie hip-hop. Produced by Elusive Orchestra's Deonte Hayes, Dot's new cut is characterized by its genuine blue-collar lyricism and its subject matter. Revolving around themes of personal plight and struggles, karma, accountability and the everyday grind that is life, the lyrical content alone deems "The Struggle" more than a spur of the moment trivial release. Deconstructing the bars on "The Struggle" are in a way a throwback to bygone era in hip-hop. 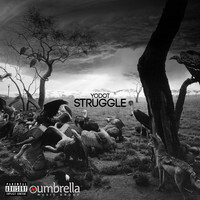 Nostalgia aside, stream "The Struggle" below and check out Yo Dot's The DJBooth x Umbrellas Up street LP, Sherman Park Memoirs and his 2012 release Red Mist which was featured as the Project of the Week in Week 15 of EARMILK's hip-hop feature Straight No Chase. Renz Young preps for new project with "Faces" & "A Northside Love Story"